Today's custom wallpaper inspiration marks the celebration of a couple milestones. 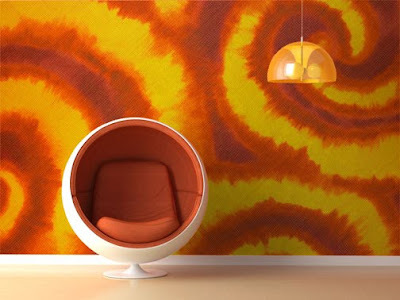 Our tie-dye inspired wallpaper is an homage to the 40th anniversary of Woodstock, held originally in August 1969. Initially billed as a music and arts festival, the event became more of a beacon of a new cultural and political awareness to the hundreds of thousands that attended as well as the country at large. As the country is currently embroiled in debates over health care, it's interesting to reflect on how different our political realm is now compared to the late '60's. One thing that hasn't changed is our affinity for tie-dye, which is a beautiful art form perfectly suited for a custom wall mural. Tie-dye techniques can be dated as far back as 500-800 AD, later becoming a cultural phenomenon and uniform of those ascribing to the "hippie" style. The circular swirling shapes of the mural compliment the round chair and light fixture effortlessly. The fact that this is our 100th custom wallpaper blog post is the second milestone. Thank you to those who have read and commented on our entries. If you've been reading this blog for a while, you know that we are truly passionate about the unique art of custom wallpaper. Though we may not have the same visionary status of those storied icons of the '60's, we share that same spirit of individuality, and hope you'll continue to share your time in reading our next 100 posts. The tie dye lines really makes this wallpaper. Great to see such creativity at work.